In my last post, I reviewed Lisa Louise Cooke’s new book The Genealogist’s Google Toolbox. The book is filled with easy to follow and well illustrated tips and techniques for using Google’s powerful search capacity. One of the results I have achieved thus far in applying some of the techniques is to uncover the naming of Margaret Avenue in Kitchener (formerly Berlin), Ontario. Margaret Avenue is an arterial type street that runs from the centre of downtown Kitchener north through the neighbouring city of Waterloo. It turns out that the street was named after Margaret Wagner Bean (or with the alternate spelling of Biehn) (nee Hailer), my wife Ellen’s great great grandmother. 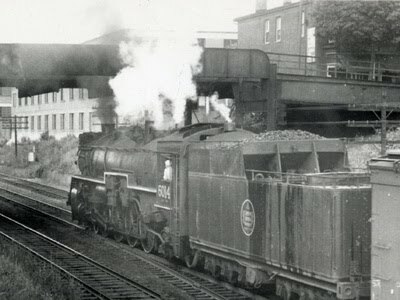 The Google search I used involved using ever more refined search keywords and operatives which lead to among other things, like a lot of my past blog postings, to a newspaper article from the Kitchener Record that included the 1958 photo to the left of a train approaching the Margaret Avenue bridge. Below is a photo, captured from Google Earth, looking north along Margaret Avenue over the same bridge. I have posted a number of stories previously about Margaret Hailer Wagner Bean who was born in 1831, a ‘stone throw’ away from the Canadian Horseshoe Falls at Niagara Falls, Ontario. Earlier posts have included among other references, excerpts from her will, newspaper reports of her last birthday party. The Record story by Jon Fear states that “Margaret Avenue was named for the sister-in-law of Philip Louis Breithaupt, an industrialist who moved from Buffalo to Berlin (now Kitchener) after launching a tannery business here in 1857. Breithaupt, a future Berlin mayor, married Catherine Hailer, daughter of a prominent early Berlin woodworker named Jacob Hailer. She had a sister, Margaret, born in 1831, who married one of Breithaupt’s close friends, Rev. Jacob Wagner. They had a son together.